ROME (Reuters) - Saudi Arabia's foreign minister said on Friday that Lebanon had been "hijacked" by Hezbollah and could only flourish if the Iranian-backed group disarmed. The Shi'ite Muslim militia was set up by the powerful Iranian Revolutionary Guards (IRGC) in the 1980s and has grown steadily in influence, sharing power in the Beirut government and giving crucial support to President Bashar al-Assad in Syria's civil war. Its growing strength has alarmed Saudi Arabia, a Sunni Muslim monarchy that is Shi'ite Iran's arch-rival for regional influence. "Lebanon will only survive or prosper if you disarm Hezbollah," Foreign Minister Adel al-Jubeir told a conference in Italy. "As long as you have an armed militia, you will not have peace in Lebanon." 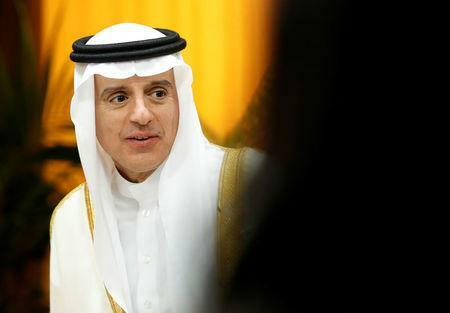 Jubeir said the situation in Lebanon was "tragic" and accused Iran of fomenting unrest across the Middle East. "Since 1979, the Iranians have literally got away with murder in our region, and this has to stop," he said. A month ago, Saad al-Hariri resigned as Lebanese prime minister while he was in Saudi Arabia, triggering a political crisis in Beirut and thrusting Lebanon onto the front line of the regional rivalry. Saudi Arabia denied coercing its long-time ally to quit, and Hariri has now returned to Beirut and indicated that he might withdraw his resignation. Elsewhere in the region, Saudi Arabia fears that Hezbollah and Iran are trying to take control of its neighbour Yemen, by supporting Houthi forces against a Riyadh-led military coalition. Hezbollah denies fighting in Yemen, sending weapons to the Houthis, or firing rockets at Saudi Arabia from Yemeni territory. Jubeir rejected this and said his country would not back down in the conflict. "The Houthis cannot be allowed to take over a country," he said. Jubeir said his country only had bad relations with two nations -- Iran and North Korea. He said Riyadh did not have relations with Israel, which shares Saudi worries over Iran, because it was waiting for a Palestinian peace deal. He said everyone knew what a solution would look like to the decades-old conflict. "It is not rocket science," he said, adding that he was waiting for the United States to put forward a new proposal. One of the most intractable problems facing negotiators is the spread of Jewish settlements across occupied territory that the Palestinians want for a future state. Jubeir said he expected an eventual deal would set the borders of a Palestinian state on the lines prevailing before the 1967 war, when Israel captured the West Bank and Gaza Strip. However, he said adjustments could be made for settlers: "Seventy percent of the settlers who are on the (1967) Green Line remain in Israel, and the other 30 percent - you offer them compensation and work out housing, and they can move to Israel."